In a recent post, I suggested that Carrollton, Mississippi, a town that proudly flies the Conderate flag outside its courthouse, reflects the soul of America. Charles Kiker, my esteemed father-in-law, calls that an overstatement. This op-ed from Massachusetts governor Deval Patrick illuminates my audacious thesis. As Patrick notes, small government fundamentalism has captured the conservative movement and, to a large extent, the conservative movement has captured American politics. True, a Democrat is in the White House and the Senate remains blue. But anyone who listened to President Obama trying to adopt a tough stance with Republicans the other day will realize that Grover Norquist’s intention has been realized: Democratic presidents can no longer govern as Democrats. Obama was trying to come on strong, but he sounded scared to death. Conservatives control the moral consensus of the nation and the President knows it. Sounds like Mississippi values to me, and this is the vision that currently dominates American politics. During the G W Bush era, neo-conservatives with utopian dreams of spreading American democracy far and wide were in the ascendency. All of that is gone now. In its place we have Grover Norquist’s Mississippi model of government. If we are serious about ending mass incarceration, we need a new vision of America. I know Norquist thinks we are spending too much on prisons, but the hardness of heart at the core of his moral philosophy lies at the root of the incarceration boom. Ebenezer Scrooge spirituality will not get us where we want to go. In a way, Republicans have accomplished that. This spring, in an effort to reduce the deficit, a Democratic president proposed to cut $2 trillion in spending, much of it from domestic programs Democrats have long championed. Last week, Republican leaders withdrew from talks with the vice president on a bipartisan plan to reduce the deficit because, as another part of the solution and like every bipartisan budget deal for decades, the president proposed to raise revenue. Specifically, he proposed to raise $1 in new revenue (through closing loopholes or ending the Bush tax cuts for the wealthiest Americans) for every $2 in spending cuts. In response to that modest proposal, Republican leaders walked out. I’d like to think that the most prosperous nation in human history can have both freedom and security. I think we have reached a point where my personal success is not threatened by a program to help our parents retire with dignity. Voters are smart enough to see that taxes are one of the ways we get those things. They are the price we pay for civilization. formula to reduce the deficit, 85% thru reduced spending, 15% by increased revenue. Democrats came up with a plan that would have been 83% reduced spending, 17% increased revenue. Surely room to negotiate there. But GOPers now have responded: 100% spending cuts, 0% revenue increase. The GOP seems bent on harming the economy in order to insure that Obama is a one-termer. Polls suggest that the American people do not like the GOP plan. It remains to be seen how this will play out at the ballot box in 2012. It is not inconceivable that a lot of these tea-party freshmen will lose their congressional seats. 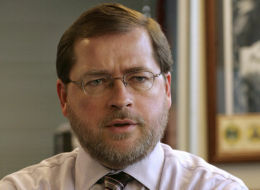 Norquist is getting his way with tea-party freshmen, who came in on a wave of discontent. But I stick to my guns in saying that Carrolton, Mississippi is not a mirror image of the soul of America. Nor is Grover Norquist. The soul of America has been taken hostage by corporate interests. The US Supreme Court is aiding and abetting the corporate interests in holding the American people hostage. (Still having difficulty. Hopefully the two previous comments even with the partial duplication clarify my intent).